This work aids ICT projects in delivering solutions which are highly accessible and usable in an efficient manner, i.e., with a minimum of additional costs. The aid comes in the form of guidelines / best-practice recommendations. The guidelines are based on a literature survey considering related research, and an analysis of development work conducted at our research institute which discusses possible pit-falls. This approach led to both high-level recommendations, such as which overall research methodology to apply, as well as detailed low-level guidelines, such as which activities to include in the project workflow and when. The advice is supported by a template for an example workflow with relevant activities. 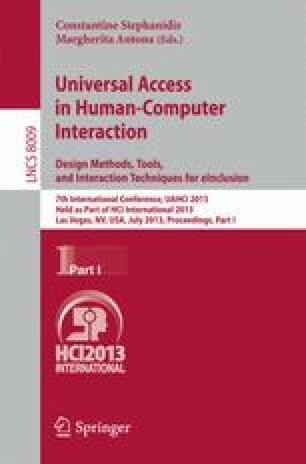 The recommendation from the literature is to extend general user centered methodology with particular activities to ensure that also individuals with impairments are accounted for, while our own development experience suggests an iterative approach with user involvement from early on in the project throughout the end.